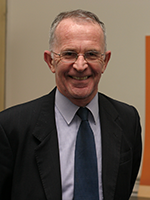 Professor Andrew Goudie was Professor of Geography and a Fellow of Hertford College from 1984 to 2003. A distinguished physical geographer, he was awarded the DSc by the University in 2002, a Royal Medal from the Royal Geographical Society in 1991, the Prize of the Royal Belgian Academy for 2002. He was President of the British Institute in Eastern Africa, 2011-2016, and from September 2005-2009 he was President of the International Association of Geomorphologists. He has recently been Director of the China Centre, Oxford (2011-2013), President of the Geographical Association, President of Section E of the British Association, and Chairman of the British Geomorphological Research Group. He is a former Delegate of the Oxford University Press and a former Pro-Vice Chancellor. Professor Goudie was Master of St Cross College, Oxford, from 2003 to 2011. He was awarded the Geological Society of America's Farouk El-Baz Prize for desert research in 2007, the David Linton Award of the British Society for Geomorphology in 2009, Honorary Fellowship of the International Association of Geomorphologists in 2013, and Fellow of the British Society for Geomorphology in 2014. He has two daughters, and his interests include collecting old books and gramophone records. Prof. Goudie's main research interests include desert geomorphology, dust storms, weathering, climatic change in the tropics, and the impacts of humans on the environment. He is also undertaking work on the landforms of Dorset and the Cotswolds. Among his recent publications are Environmental Change, the Human Impact on the Environment, The Earth Transformed, the Nature of the Environment, The Changing Earth, The Landforms of England and Wales, the Physical Geography of Africa and Geomorphological Techniques. Goudie, A.S. and Viles, H.A. (2017) Geomorphology in the Anthropocene. Cambridge University Press. ISBN: 9781107139961. Goudie, A.S. (2017) Great Desert Explorers. Silphium Press. pp. 352. ISBN: 13 978-1-900971-45-4. Goudie, A.S. (2013) Arid and Semi-Arid Geomorphology. Cambridge University Press. 461 pp. ISBN: 9781107005549. Anderson, D., Goudie, A.S., and A.G. Parker (2013) Global Environments through the Quaternary, 2nd Ed. Oxford. 424 pp. ISBN: 978-0-19-969726-7. Gregory, K.J. and Goudie, A.S. (eds.) (2011) The SAGE Handbook of Geomorphology, SAGE. 610 pp. ISBN: 9781412929059. Goudie, A.S. and Viles, H.A. (2010) Landscapes and Geomorphology: A very short introduction. Oxford University Press, 144 pp. ISBN-10: 0199565570. Alcántara-Ayala, I. and Goudie, A.S. (2010) Geomorphological Hazards and Disaster Prevention. Cambridge University Press, 304 pp. ISBN-13: 9780521769259. Cuff, D.J. and Goudie, A.S. (eds.) (2009) The Oxford Companion to Global Change. Oxford University Press. Goudie, A.S. (2008) Wheels Across the Desert: Exploration of the Libyan Desert by Motorcar 1916-1942. Silphium Press. Goudie, A.S. and Kalvoda, J. (2007) Geomorphological Variations. Prague. Goudie, A.S. and Middleton, N.J. (2006) Desert Dust in the Global System. Springer. Goudie, A.S. (2004) Arid Lands geomorphology. Routledge. Goudie, A.S. (2004) Encyclopedia of Geomorphology. Routledge. Goudie, A.S. (2003) Desertification in the third millennium. Balkema. Goudie, A.S. (2002) Encyclopedia of Global Change. Oxford University Press. Goudie, A.S. (2002) Great Warm Deserts of the World: landscape and evolution. Oxford University Press. Goudie, A.S. (2001, fourth edition; 1995, German edition; 1993, third edition; 1989, second edition; 1984, first edition) The Nature of the Environment, Blackwell. Goudie, A.S. and Thomas, D.S.G. (2000, third edition; 1994 second edition; 1984, first edition) The Encyclopedic Dictionary of Physical Geography, Blackwell. Goudie, A.S. (2001) Encyclopedia of Global Change. Oxford University Press. Goudie, A.S., Livingstone, I., and Stokes, S. (1999) Aeolian environments, sediments and landforms. Goudie, A.S. and Viles, H.A. (1997) The Earth Transformed, Blackwell. Goudie, A.S. and Viles, H.A. (1997) Salt weathering hazards, Wiley. Goudie, A.S. (1997) Climate, Weidenfeld. Goudie, A.S. and Brundsen, D. (1997) The East Dorset Coast, Geographical Association. Goudie, A.S. and Brundsen, D. (1997) The West Dorset Coast, Geographical Association. Goudie, A.S. (1997) The Human Impact Reader, Blackwell. Goudie, A.S., Adams, W. and Orme, A.R. (1996) The Physical Geography of Africa, Oxford University Press. Goudie, A.S. and Parker, A.G. (1996) The Geomorphology of the Cotswolds, Cotswold Naturalists' Field Club. Goudie, A.S. (1995) The Changing Earth: Rates of geomorphological processes, Blackwell. Goudie, A.S. and Brundsen, D. (1994) The Environment of the British Isles: an Atlas, Oxford University Press. Goudie, A.S., Cooke, R.U. and Warren, A. (1993) Desert Geomorphology. UCL Press, London. Goudie, A.S., Rogers, A. and Viles, H.A. (1992) The Students Companion to Geography, Blackwell. Goudie, A.S., Harmse, J.T. and Oliver, P.G. (1990) A bibliography of pans and related deposits. Rand Afrikaans University Press, Johannesburg. Goudie, A.S. (1990) Techniques for Desert Reclamation, Wiley. Goudie, A.S. and Gardner, R.A.M. (1984, first edition; 1992, second edition) Discovering Landscape in England and Wales, Chapman and Hall. Goudie, A.S. (1981, first edition; 1991, second edition) Geomorphological Techniques. Allen and Unwin. Goudie, A.S. and Watson, A. (1980, first edition; 1990, second edition) Desert Geomorphology, Macmillan. Goudie, A.S. (1977, first edition; 1983, second edition; 1992, third edition; also Chinese edition) Environmental Change, Oxford University Press. Goudie, A., Kent, P. and Viles, H. (2016) Pan morphology, Distribution and formation in Kazakhstan and Neighbouring areas of the Russian federation. Desert, 21(1): 1-13. Sehhati, M.T., Sepehr, A., Ekhtesasi, M.R. and Goudie, A. (2015) The eco-geomorphological roles of rocky deep crevices for water supply on arid zone mountain slopes (case study: Mehriz-Yazd, Iran). Environmental Earth Science, 74(1): 493-504. Schnepfleitner, H., Sass, O., Fruhmann, S., Viles, H. and Goudie, A. (2015) A multi-method investigation of temperature, moisture and salt dynamics in tafoni (Tafraoute, Morocco). Earth Surface Processes and Landforms, 41(4): 473-485. Goudie, A.S. (2014) Desert dust and human health disorders. Environment International, 63: 101-113. Migoń, P. and Goudie, A. (2014) Sandstone Geomorphology of South-West Jordan, Middle East. Quaestiones Geographicae, 33(3): 123-130. Atkinson, O.A.C., Thomas, D.S.G., Parker, A.G. and Goudie, A.S. (2013) Late Quaternary humidity and aridity dynamics in the northeast Rub'al-Khali, United Arab Emirates: Implications for early human dispersal and occupation of eastern Arabia. Quaternary International, 300: 292-301. Goudie, A.S. (2013) Parabolic dunes: distribution, form, morphology and change. Annals of Arid Zone, 50: 1-7. Rashki, A., Kaskaoutis, D.G., Goudie, A.S. and Kahn, R.A. (2013) Dryness of ephemeral lakes and consequences for dust activity: The case of the Hamoun drainage basin, southeastern Iran. Science of the Total Environment, 463-464: 552-564. Atkinson, O.A.C., Thomas, D.S.G., Goudie, A.S. and Parker, A.G. (2012) Holocene development of multiple dune generations in the northeast Rub' al-Khali, United Arab Emirates. The Holocene, 22: 179-189. Griffiths, J.S., Fookes, P.G., Goudies, A.S., Stokes, M. and Engineering Group Working Party (2012) Processes and landforms in deserts. Engineering Geology Special Publications, 24, 339-95. Atkinson, O.A.C., Thomas, D.S.G., Goudie, A.S. and Bailey, R.M. (2011) Late Quaternary chronology of major dune ridge development in the north east Rub' al-Khali, United Arab Emirates. Quaternary Research, 76: 93-105. Goudie, A.S. (2011) Desertification. In, J.O. Nriagu (ed.) Encyclopedia of Environmental Health, volume 2, pp. 30-35, Burlington: Elsevier. Goudie, A.S. and Seely, M. (2011) World Heritage Desert Landscapes: Potential Priorities for the Recognition of Desert Landscapes and Geomorphological Sites on the World Heritage List. Gland, Switzerland: IUCN. 44pp. Ravi, S., D'Odorico, P., Breshears, D.D., Field, J.P., Goudie, A.S., Huxman, T.E., Li, J., Okin, G.S., Swap, R.J., Thomas, A.D., Van Pelt, S., Whicker, J.J. and Zobeck, T.M. (2011) Aeolian processes and the biosphere. Reviews of Geophysics, 49(3), RG3001. Goudie, A.S. (2010) Dayas: distribution and morphology of dryland solutional depressions developed in limestones. Zeitschrift für Geomorphologie, 54(2): 145-159. Goudie, A.S. and Boardman, J. (2010) Soil erosion. Chapter 14 in, Alcántara-Ayala, I. and Goudie, A.S. (eds.) Geomorphological Hazards and Disaster Prevention. Cambridge University Press, pp. 177. ISBN-13: 9780521769259. Bourke, M.C. and Goudie, A.S. (2009) Varieties of barchan form in the Namib Desert and on Mars. Aeolian Research, 1(1-2): 45-54. Goudie, A.S. (2009) Aeolian processes and landforms. In, Woodward, J.C. (ed.) The Physical Geography of the Mediterranean. OUP, pp. 415-429. Goudie, A.S. (2009) Dust storms: recent developments. Journal of Environmental Management, 90(1): 89-94. Goudie, A.S. (2009) Global deserts and their geomorphological diversity. In Parsons, A.J. and A.D. Abrahams (eds.) Geomorphology of Desert Environments, 2nd edition. Springer, pp. 9-20. Goudie, A.S. (2009) Namib Sand Sea: large dunes in an ancient desert. Chapter 17 in, P. Migoń (ed.) Geomorphological Landscapes of the world. Springer. Goudie, A.S. (2008) The history and nature of wind erosion in deserts. Annual Review of Earth and Planetary Science, 36: 97-119. Singh, R.N., Petrie, C.A., French, C.A.I., Goudie, A.S., Gupta, S., Tewari, R., Singh, A.K., Sinha, R., Srivastava, R., Yadav, S. and Singh, V.K. (2008) Settlements in Context: Reconnaissance in Western Uttar Pradesh and Haryana. Man and Environment, XXXIII(2): 71-87. Viles, H.A. and Goudie, A.S. (2007) Rapid salt weathering in the coastal Namib Desert: Implications for landscape development. Geomorphology, 85: 49-62. Goudie, A.S. (2006) Mega-yardangs: A global analysis. Geography Compass, 1(1): 65-81. Goudie, A.S., Ozer, P. and Courel, M-F. (2006) International Year of Deserts, Desertification and Dust. Africa Health, 3: 1p. Goudie, A.S., Washington, R. et al (2006) Links between topography, wind, deflation, lake and dust: The case of the Bodélé Depression, Chad. Geophysical Research Letters, 33. Goudie, A.S. (2006) The history and evolution of desert hydrology and landforms: the role of climate change. In, P. D'Odorico and A. Porporato (eds.) Dryland Ecohydrology, pp. 129-140. Dordrecht: Springer. Goudie, A.S. (2005) Rocks under pressure. Physics World, 18(5): 22p. Goudie, A.S., with P. Migon et al. (2005) The origin and development of footslope ramps in the sandstone desert environment of south-west Jordan. Journal of Arid Environments, 60: 303-320. Goudie, A.S. and Viles, H.A. (2004) Biofilms and case hardening on sandstones from Al-Quwayra, Jordan. Earth Surfaces Processes and Landforms, 29: 1473-1485. Shaw, A.I. and Goudie, A.S. (2004) Chemical sediments of the palaeo and active Okavango alluvial fan, Botswana: evidence for variations in the processes of formation. Zeitschrift für Geomorphologie, Supplementbände 136: 89 �112. Goudie, A.S. (2003) The impacts of global warming on the geomorphology of arid lands. In, A.L. Alsharhan et al. (eds.) Desertification in the third millennium. pp. 13-20. Goudie, A.S., Washington, R. et al (2003) Dust-storm source areas determined by the Total Ozone Monitoring Spectrometer and surface observations. Annals of the Association of American Geographers, 93(2): 297-313. Goudie, A.S., Washington, R., et al (2003) North African Dust production: source areas and variability. Clivar Exchanges - Scientific Contributions, 27, 4 pp. Goudie, A.S. (2002) Dust storms in the middle east. Bulletin de la Classe des Sciences, Academie Royal de Belgique, 6(13): 379-399. Goudie, A.S. and Shaw, A. (2002) Geomorphological evidence for the extension of the Mega-Kalahari into South-Central Angola. South African Geographical Journal, 84: 182-194. Goudie, A.S., Wright, E. and Viles, H.A. (2002) The roles of salt (sodium nitrate) and fog in weathering: a laboratory simulation of conditions in the northern Atacama Desert, Chile. Catena, 48: 255-66. · Goudie, A.S., Parker, A.G., Bull, P.A., White, K. and Al-Farraj, A. (2001) Desert loess in Ras Al Khaimah, United Arab Emirates. Journal of Arid Environments, 46: 123-135. Goudie, A.S. (2001) The global distribution of dust storms. Annals of the Arid Zone, 40: 1-12. Goudie, A.S. (2001) Sandstone geomorphology of the Al-Quwayra area of south Jordan. Zeitschrift für Geomorphologie, 46: 365-390. Goudie, A.S., Eckardt, F.D. et al (2001) The role of playas in the formation of pedogenc gypsum crusts in the Central Namib Desert. Earth Surface Processes and Landforms, 26: 1177-1193. Goudie, A.S. and Middleton, N.J. (2001) Saharan Dust: Sources and Trajectories. Transactions of the Institute of British Geographers, 26: 165-181. Goudie, A.S., White, K. et al (2001) Mapping the geochemistry of the Northern Rub' Al Khali using multispectral remote sensing techniques. Earth Surface Processes and Landforms, 26: 735-748. Goudie, A.S. and Middleton, N.J. (2001) Saharan Dust Storms: nature and consequences. Earth-Science Reviews, 56: 179-204. Goudie, A.S. et al (2000) Desert loess in Ras Al Khaimah, United Arab Emirate. Journal of Arid Environments, 46: 123-135. Goudie, A.S. and Middleton, N. (2000) Dust storms in south west Asia. Acta Universitatis Carolinae, XXXV Supplement: 73-83. Goudie, A.S. and Viles, H.A. (2000) The thermal degradation of marble. Acta Universitatis Carolinae, XXXV, Supplement: 7-16. Goudie, A.S. and Migon, P. (2000) Granite Landforms of the Central Namib. Acta Universitatis Carolinae, XXXV Supplement: 17-38. Goudie, A.S. and Viles, H.A. (2000) Weathering, Geomorphology and climatic variability in the Central Namib Desert. In, McClaren, S.J. and Kniveton, D.R. (eds.) Linking Climate Change to Land Surface Change. pp. 65-82. Goudie, A.S. and Eckardt, F. (1999) The evolution of the morphological framework of the Central Namib Desert, Namibia, since the early cretaceous. Geografiska Annaler, 81(A): 443-458. Goudie, A.S., Stokes, S. et al (1999) Accurate dune displacement and morphometric data using kinematic GPS. Zeitschift für Geomorphologie, Supplementbände 116: 195-214. Goudie, A.S., Stokes, S. et al (1999) Yardang landforms from Kharga Oasis, south-western Egypt. Zeitschift für Geomorphologie, Supplementbände 116: 97-112. Goudie, A.S. (1999) Experimental salt weathering of limestones in relation to rock properties. Earth Surface Processes and Landforms, 24: 715-724. Goudie, A.S. and White, K. et al. (1998) Towards and understanding of the spectral reflectance of desert dune sands; viewing geometry and particle size dependence of dune colour. Proceedings of the 24th Annual Conference Remote Sensing Society: 473-479. Goudie, A.S. and Parker, A.G. (1998) Experimental simulation of rapid rock block disintegration by sodium chloride in a foggy coastal desert. Journal of Arid Environments, 40: 347-355. Goudie, A.S. (1998) The salt weathering hazard in deserts. In, Kalvoda, J. and Rosenfeld, C.L. (Eds.) Geomorphological hazards in High Mountain areas. Kluwer. pp. 107-120. Goudie, A.S., Viles, H.A. and Parker, A.G. (1997) Monitoring of rapid salt weathering in the central Namib using limestone blocks. Journal of Arid Environments, 37: 581-598. Goudie, A.S. and Migon, P. (1997) Weathering pits in the Spitzkoppe area, Central Namib Desert. Zeitschift für Geomorphologie, 41(4): 417-444. Goudie, A.S. (1996) Organic agency in calcrete development. Journal of Arid Environments, 32: 103-110. Goudie, A.S. and Viles, H.A. (1995) The nature and pattern of debris liberation by salt weathering: a laboratory study. Earth Surface Processes and Landforms, 20: 437-449. Goudie, A.S. and Wells, G.L. (1995) The nature, distribution and formation of pans in arid zones. Earth-Science Reviews, 38: 1-69. Goudie, A.S. (1994) Deserts in a warmer world. In, Pye, K. and Millington, A. (Eds.) Environmental Change in Deserts, Wiley, Chichester. Goudie, A.S. (1994) Salt attack on buildings and other structures in arid lands. In, Fookes, P.G. and Parry, R.H.G. (Eds.) Engineering characteristics of Arid Soils. Balkema, Rotterdam. pp. 15-28. Goudie, A.S. (1994) Dryland degradation. In, Roberts, N. (Ed.) The Changing Global Environment. Blackwell, Oxford. pp. 351-368. Goudie, A.S., Stokes, S., et al (1993) Post-depositional modification of the linear sand ridges of the West Kimberley area, north-west Australia. Geographical Journal, 159: 306-317. Goudie, A.S. (1993) Salt weathering simulation using a single immersion technique. Earth Surface Processes and Landforms, 18: 369-376. Goudie, A.S. (1992) Expedition Research Projects in savanna landscapes - earth science aspects. In, Winser, S. and McWilliam, N. (Ed.) Expedition Planner's Handbook and Directory 1993-4 London: Royal Geographical Society. Goudie, A.S., Sands, M.J. and Livingstone, I. (1992) Aligned linear gilgai in the West Kimberley District, Western Australia. Journal of Arid Environments, 23: 157-67. Goudie, A.S. and Middleton,N.J. (1992) The changing frequency of dust storms through time. Climatic Change, 20: 197-225. Goudie, A.S. (1991) Pans. Progress in Physical Geography, 15: 221-237. Goudie, A.S. (2013) The Schmidt Hammer and related devices in geomorphological research. In, Shroder, J., Switzer A.D. and Kennedy D.M. (eds. )Treatise on Geomorphology, volume 14. pp. 338-345. Academic Press: San Diego. Goudie, A.S. and Viles, H.A. (2012) Weathering and the global carbon cycle: geomorphological perspectives. Earth-Science Reviews, 113(1-2): 59-71. Migoń, P. and Goudie, A.S. (2012) Pre-Quaternary geomorphological history and geoheritage of Britain. Quaestiones Geographicae, 31(1): 63-75. Brierley, G., Huang, H.Q., Chen, A., Aiken, S., Crozier, M., Eder, W., Goudie, A.S., Ma, Y., May, J-H., Migon, P., Nanson, G., Qi, D., Viles, H.A., Wood, C., Wray, R., Yang, G., Yang, X. and Yu, G-A. (2011) Naming conventions in geomorphology: contributions and controversies in the sandstone landscape of Zhangjiajie Geopark, China. Earth Surface Processes and Landforms, 36(14): 1981-1984. Goudie, A.S. (2011) Geomorphology: its early history. In, Gregory, K.J. and Goudie, A.S. (eds.) (2011) The SAGE Handbook of Geomorphology, SAGE. pp. 21-35. ISBN: 9781412929059. Grab, S., Goudie, A.S., Viles, H.A. and Webb, N. (2011) Sandstone geomorphology of the Golden Gate Highlands National Park, South Africa, in a global context. Koedoe, 53(1). Gregory, K.J. and Goudie, A.S. (2011) Introduction to the discipline of geomorphology. In, Gregory, K.J. and Goudie, A.S. (eds.) (2011) The SAGE Handbook of Geomorphology, SAGE. pp. 1-20. ISBN: 9781412929059. Gregory, K.J. and Goudie, A.S. (2011) Conclusion. In, Gregory, K.J. and Goudie, A.S. (eds.) (2011) The SAGE Handbook of Geomorphology, SAGE. pp. 577-586. ISBN: 9781412929059. Viles, H.A., Goudie, A.S., Grab, S. and Lalley, J. (2011) The use of the Schmidt Hammer and Equotip for rock hardness assessment in geomorphology and heritage science: a comparative analysis. Earth Surface Processes and Landforms, 36(3): 320-333. Goudie, A.S. (2009) Possible future changes in geomorphological hazards in Latin America. In, E. Latrubesse, (ed.) Developments in Earth Surface Processes. Elsevier. Goudie, A.S. and Kalvoda. J. (2007) Landform evolution in the Nagar region, Hispar Mustagh Karakoram. In, A.S. Goudie and J. Kalvoda (eds. ), Geomorphological Variations, pp. 87-126. Goudie, A.S. (2006) The Schmidt Hammer in geomorphological research. Progress in Physical Geography, 30: 703-718. Goudie, A.S. and Heslop, E. (2007) Sodium nitrate deposits and surface efflorescences. Chapter 12 in, Nash, D.J. and McLaren, S.J. (eds.) Geochemical Sediments and Landscapes. Blackwell Publishing. Goudie, A.S. (2006) Global warming and fluvial geomorphology. Geomorphology. Goudie, A.S. (2005) The drainage of Africa since the Cretaceous. Geomorphology, 67(3-4): 437-456. Goudie, A.S. (2004) Baer's Law of Stream Deflection. Earth Sciences History, 23(2): 278-282. Goudie, A.S. (2002) Aesthetics and relevance in geomorphological research. Geomorphology, 47: 245-9. Goudie, A.S. (2001) Applied Geomorphology: an introduction. Zeitschrift für Geormorphologie Supplementbände, 1224: 101-110. Goudie, A.S. and Migon, P. (2001) Inherited landscapes of Britain - Possible reasons for survival. Zeitschrift für Geormorphologie, 45: 417-441. Goudie, A.S. (2000) Experimental physical weathering. Zeitschrift für Geormorphologie, 120: 133-144. Goudie, A.S., Parker, A.G. and Al'Farraj, A. (2000) Coastal change in Ras al Khaimah (United Arab Emirates): a cartographic analysis. The Geographical Journal, 166: 14-25. Goudie, A.S. (1999) A comparison of the relative resistance of limestones to frost and salt weathering. Permafrost and Periglacial Processes, 10: 309-316. Goudie, A.S. and Viles, H.A. (1999) The frequency and magnitude concept in relation to rock weathering. Zeitschrift für Geormorphologie, Supplementbände 115: 175-189. Goudie, A.S. Experimental Physical Weathering. Zeitschrift für Geormorphologie, Supplementbände 120: 133-144. Goudie, A.S. (1996) The Geomorphology of the Cotswolds. Cotswold Naturalists' Field Club, 139. Goudie, A.S. (1996) Geomorphological 'hotspots' and global warming. Interdisciplinary Science Reviews, 21(3): 253-259. Goudie, A.S., Brundsen, D., Coombe, K., and Parker, A.G. (1996) The structural geomorphology of the Isle of Portland, southern England. Proceedings Geologists' Association, 107: 209-230. Goudie, A.S. (1994) The geomorphology of Great Britain. BCRA Cave Studies Series, 5: 3-7. Goudie, A.S. (1994) The effects of fire on rock weathering: an experimental study. In, Robinson, D.A., and Williams, R.B.G. (Eds.) Rock Weathering and landform evolution. Wiley, Chichester. pp. 41-56. Goudie, A.S., Allison, R.J. and Cox, N. (1993) Geotechnical properties of rock masses: their control on slope form and mechanisms of change. Geomorphology, 8: 65-80. Goudie, A.S. (1993) Land Transformation. In, Johnston, R.J. (Ed.) The Challenge for Geography A Changing World: A Changing Discipline. The Institute of British Geographers Special Publication Series, 28: 117-137. Goudie, A.S. (1993) Human influence in geomorphology. Geomorphology, 7: 37-59. Goudie, A.S., McLaren, S.J. and Allison, R.J. (1992) The relations between modulus of elasticity and temperature in the context of the experimental simulation of rock weathering by fire. Earth Surface Processes and Landforms, 17: 605-15. Goudie, A.S. and Viles, H.A. (1992) Weathering of limestone columns from the Weymouth Seafront, England. Proceedings, 7th International Congress Stone Deterioration and Conservation, Lisbon. pp. 297-304. Goudie, A.S. and Viles, H.A. (1990) Tufas, travertines and related freshwater carbonates. Progress in Physical Geography, 14: 19-41. Goudie, A.S. and Allison, R. (1990) Rock control and slope profiles in a tropical limestone environment: The Napier Range of Western Australia. Geographical Journal, 156: 200-211. Goudie, A.S. (1990) The global geomorphological future. Zeitschrift für Geormorphologie, Supplementbände 79: 51-62. Goudie, A.S., Viles, H.A., Allison, R., Day, M. Livingstone, I. and Bull, P. (1990) The geomorphology of the Napier Range, Western Australia. Transactions, Institute of British Geographers NS, 15: 308-322. Goudie, A.S. and Viles, H. (1990) Reconnaissance studies of the tufa deposits of the Napier Range, N.W. Australia. Earth Surface Processes and Landforms, 15: 425-443. Burt, T.P., Chorley, R.J., Brunsden, D., Cox, N.J. and Goudie, A.S. (eds.) (2008) The History of the Study of Landforms or the Development of Geomorphology, Vol. 4: Quaternary and Recent Processes and Forms (1890�1965) and the Mid-Century Revolutions. The Geological Society, London. Includes, Goudie, A.S and Viles, H.A., Ch.5, pp. 129-164, Weathering processes and forms; Goudie, A.S., Ch.s 10 & 16. Parker, A.G. and Goudie, A.S. (2008) Geomorphological and palaeoenvironmental investigations in the southeastern Arabian Gulf region and the implication for the archaeology of the region. Geomorphology, 101: 458-470. Parker, A.G., Lucas, A.S., Walden, J., Goudie, A.S., Robinson, M.A. and Allen, T.G. (2008) Late Holocene geoarchaeological investigation of the Middle Thames floodplain at Dorney, Buckinghamshire, UK: An evaluation of the Bronze Age, Iron Age, Roman and Saxon landscapes. Geomorphology, 101: 471-483. Parker A.G., Goudie, A.S., Stokes, S., White, K., Hodson, M.J., Manning, M., and D. Kennet (2006) A record of Holocene climate change from lake geochemical analyses in southeastern Arabia. Quaternary Research, 66: 465-476. Parker, A.G. and Goudie, A.S. (2007) Development of the Bronze Age landscape in the southeastern Arabian Gulf: New evidence from a buried shell midden in the eastern extremity of the Rub' al-Khali desert, Emirate of Ras al-Khaimah, U.A.E. Arabian Archaeology and Epigraphy, 18(2): 132-138. Parker, A.G., Eckersley, L., Smith, M.M., Goudie, A.S., Stokes, S., Ward, S., White, K. and Hodson, M.J. (2004) Holocene vegetation dynamics in the north eastern Rub' al-Khali desert, Arabian Peninsula: a phytolith, pollen and carbon isotope study. Journal of Quaternary Science, 19: 665-676. Goudie, A.S., Ward, S., et al (2003) Optical dating of quartz from young samples and the effects of pre-heat temperature. Radiation Measurements 37: 401-407. Goudie, A.S., Parker, A.G. et al (2002) A review of the mid-Holocene elm decline in the British Isles. Progress in Physical Geography, 26: 1-45. Goudie, A.S. and Colls, A. et al (2000) Late Pleistocene and Holocene dune construction at the north eastern edge of the Rub Al Khali, United Arab Emirates. Sedimentology, 47: 1011-1021. Goudie, A.S. and Parker, A.G. (2000) A microwave digestion method for the preparation of pollen samples. Quaternary Newsletter, 91: 10-14. Goudie, A.S. and Dollar, E. (2000) Environmental Change. In, Fox, R. and Rowntree, K. (eds.) The Geography of South Africa in a Changing World. Oxford University Press, Cape Town. pp. 31-59. Goudie, A.S. and Parker, A.G. et al (2000) Desert loess in Ras-Al Khaimah, United Arab Emirates. Journal of Arid Envionments. Goudie, A.S. (1999) The distribution and modes of origin of peat and calcareous tufa deposits in the Upper Thames valley. Proceedings of the Cotswold Naturalists' Field Club, 41: 230-248. Goudie, A.S. (1999) The Ice Age in tropics and its human implications. In, Slack, P.A. (Ed.) Environments and Historical Change. pp. 10-32. Goudie, A.S., Viles, H.A. and Pentecost, A. (1993) The Holocene tufa decline in Europe. The Holocene, 3: 181-186. Goudie, A.S. (1991) The climatic sensitivity of desert margins. Geography, 76: 73-76. Goudie, A.S. (2007) Dust storms. Geography Review, 21(1): 8-11. Goudie, A.S. (2002) Aesthetics and relevance in geomorphological research. Geomorphology 47: 245-249. Goudie, A.S. (2000) Trends in physical geography. In, A. Kent (ed.) Reflective Practice in Geography Teaching, London: Paul Chapman. pp. 3-10. Goudie, A.S. with E. Dollar (2000) Environmental Change. In, R. Fox and K. Rowntree (eds.) The Geography of South Africa in a Changing World. Cape Town: Oxford University Press. pp. 31-59. Goudie, A.S. (2000) The integration of Physical Geography. Geographica Helvetica, 3: 163-168. Goudie, A.S., Eckardt, F., and Viles, H.A. (1995) Geomorphological hazards in the Namib Desert. Geography Review, 9(3): 38-41. Goudie, A.S. (1994) Timing shape and shaping time. Geography Review, 8(2): 25-29. Goudie, A.S. (1994) The nature of physical geography: a view from the drylands. Geography: 194-209. Goudie, A.S. (1993) Environmental Uncertainty. Geography, 78: 137-141. Goudie, A.S. (1990) Environment in the 1990s. Journal of Geography, 89(2): 50-51. Goudie, A.S. (2017) The integration of Human and Physical Geography revisited. The Canadian Geographer / Le Géographe canadien, 61(1): 19-27. Goudie, A.S. (2016) Anthropocene. In, Wohl, E. (ed.) Oxford Bibliographies in Environmental Science. Oxford University Press, New York. Goudie, A.S. (2013) Major themes in British and European Geomorphology in the nineteenth century. In J.F. Shroder (ed.) The Treatise on Geomorphology, volume 1, pp. 37-52. Academic Press, San Diego. Goudie, A.S. (2012) Charles Rollin Keyes and extravagant aeolation. Aeolian Research, 4: 51-53. Goudie, A.S. (2012) Southern African Geomorphology: the past and the future. In P.J. Holmes and M.E. Meadows (eds.) Southern African Geomorphology. Sun Press: Bloemfontein. Goudie, A.S. (2010) Environmental change. In J.A. Agnew and D.N. Livingstone (eds.) The SAGE handbook of Geographical Knowledge, pp. 528-539. Goudie, A.S. (2010) Ralph Bagnold. In R. Hanbury-Tenison (ed.) The Great Explorers. Thames and Hudson, pp. 220-224. Goudie, A.S. (2009) Von Humboldt, Alexander, 1769-1859. In, B.B. Caldicott and R. Frodeman (eds.) Encyclopedia of Environmental Ethics and Philosophy, vol. 2, pp. 378-379. Goudie, A.S. (2008) Three chapters in Volume 4 of The History of the Study of Landforms (ed. by T.P. Burt et al.). Geological Society of London. Goudie, A.S. (2003) Global perspective on the history of landscape transformation. In B. Benzing and B. Herrmann (eds.) Exploitation and Overexploitation in Societies Past and Present. LIT Verlag, Munster. pp. 3-20. Goudie, A.S. (2000) The integration of physical geography. Geographica Helvetica 3: 163-168. Goudie, A.S. (1998) Kenneth J. Mason 1887-1976. Geographers Bibliographical Studies, 18: 67-72. Goudie, A.S. (1998) Classics in physical geography revisited. Progress in Physical Geography, 22: 247-249.